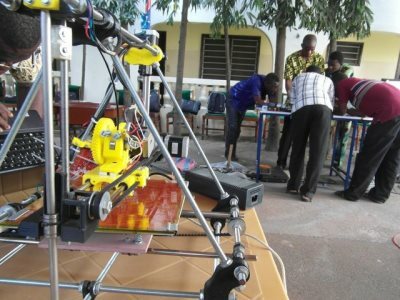 AFRICANGLOBE – Kodjo Afate Gnikou, a resourceful inventor from Togo in West Africa, has made a $100 3D printer which he constructed from parts he scrounged from broken scanners, computers, printers and other e-waste. The fully functional DIY printer cost a fraction of those currently on the market, and saves environmentally damaging waste from reaching landfill sites. Discarded electronic equipment is one of the world’s fastest-growing sources of waste, as consumers frequently replace “old” models that become more obsolete each year. 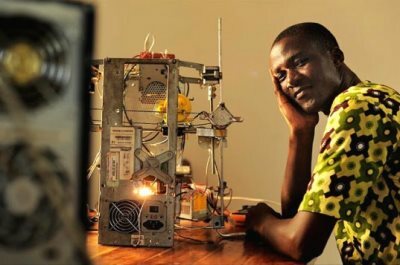 However instead of letting e-waste sit them on the scrap pile or head to the landfill, Kodjo Afate Gnikou decided to utilize spare parts in order to create a cheap, DIY 3D printer. Gnikou is part of WoeLab, a hackerspace in the city of Lomé, and has big plans for his recycling project. According to his crowd funding page, he is working with FacLab-France in the WAFATE to Mars project, which aims to make machines from recycled e-waste to prepare for missions on Mars. Systems like the 3D printer could become a crucial part of missions on the Red Planet should they ever go ahead. 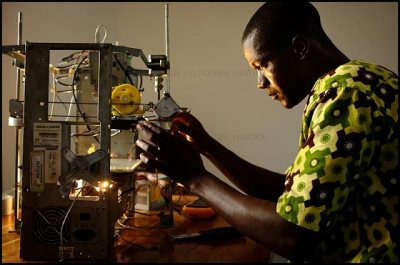 Gnikou’s 3D printer was mostly made from materials he obtained from a junk yard in Lomé, though he did have to buy a few parts. The entire system cost about $100 which is a bargain considering current models on the market can cost thousands of dollars. To support Gnikou’s project, click here.